Ingram Barge Company (Ingram) has been a quality marine transporter since 1946, starting out as a small, family-owned business and growing into what they are today: the leading carrier on America’s inland waterways. Ingram owns nearly 5,000 barges; those barges are powered by the industry’s best towboat fleet, which includes approximately 150 towboats that are maintained at the highest level of standards and are equipped with state-of-the-art navigation and communication technology. They transport a high volume of dry bulk commodities, including coal, aggregates, grain, fertilizer, ores, alloys, and steel products, as well as liquid bulk cargoes, on over 4,500 miles of America’s inland waterways system. With the recent growth of shipments of grain, soybeans, corn and salt through the Panama Canal, and with the expansion of the canal nearing completion, Ingram is currently focused on cargo versatility. They have poised themselves to take on increased demand and continue to showcase the vitality of the US inland waterways and their ability to remain competitive in the global marketplace. As part of their cargo versatility mission, Ingram is also leading the charge in finding new, efficient ways to move cargo on the US waterways. 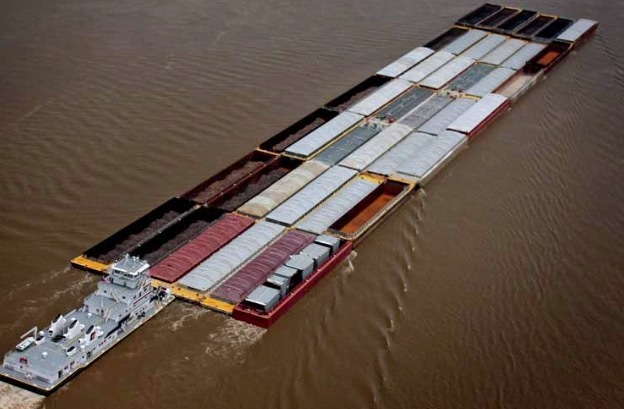 In March 2015, Ingram partnered with the Paducah-McCracken County Riverport Authority (Kentucky) to conduct a trial run of a hopper barge loaded with 54 containers from Paducah, Kentucky, to St. Louis, Missouri, and back. Long a mainstay on waterways around the world, container-on-barge shipment on America’s inland waterways is not nearly as common — this trial was conducted to demonstrate the viability of intermodal river transportation, and by all accounts was a great success. This method has the potential to support new growth across many industries, including import and export businesses, and greatly benefit the nation’s economy. Currently, American highways and railways are operating at near full capacity, and Ingram understands there is substantial room to grow in transporting goods on the nation’s rivers, with minimal investment. Besides having room for expansion, the inland waterways network is the safest and most environmentally friendly mode of transporting cargo in the US. As the largest carrier on the inland waterway system, Ingram feels responsibility to lead in environmental sustainability. nation’s waterways, from the smallest stream to the largest river. The US river system is an incredible resource that brings stability and prosperity to the global economy. Barge transportation not only supports the communities along the waterways; its economic impacts reach far beyond the river banks. Remaining an industry leader in environmental stewardship is a commitment Ingram takes seriously. For its customers, this means moving more cargo over greater distances, using less energy and water, and creating less waste. For its associates and the community, it means doing so in the safest manner as well. Ingram’s sustainable efforts have been recognized by the U.S. Environmental Protection Agency (EPA) and the US Coast Guard (USCG). In 2010, Ingram was named the first marine transportation partner in the EPA SmartWay programme. In 2011, Ingram received the EPA’s Southeast Diesel Collaborative Award for emissions reduction innovation. In 2012, Ingram was awarded the USCG’s William M. Benkert Marine Environment Protection Gold award. This biennial award recognizes outstanding marine environmental achievements that go beyond mere compliance of industry and regulatory standards. Ingram has partnered with diverse stakeholders committed to environment improvements, such as America’s Great Watershed Initiative, Great Rivers Partnership,The Nature Conservancy, Living Lands and Waters, and the Cumberland River Compact. Engaging stakeholders to provide awareness and understanding of Ingram’s leadership and commitment to responsible navigation, communities and the environment is helping to build a better tomorrow. Ingram has innovatively bridged the chasm between goals and principles of sustainability through action and commitment, now and in the future. Hardly a week goes by without news of a new project aimed at getting more of the grains grown in the centre and north east of Brazil to ports, along Brazil’s extensive network of inland waterways, writes Patrick Knight. Between them the trading companies active in Brazil, ADM, Bunge, Cargill, Dreyfus, Noble, Maggi, Caramaru and several others have ordered several hundred barges and dozens of the vessels which will push barge trains carrying up to 50,000 tonnes each, along rivers to seagoing ports. Transport by road, the dominant method until now, is becoming steadily more expensive, while spending on rail has not kept pace with the growth in output, expected to increase by 50% in the next decade. At the moment, 80% of the 50mt (million tonnes) of soya and 40mt of maize grown each year in the north of the country, which is half the countrys’ total, with most to be exported, leaves from three ports in the south east and south of the country, Santos, Paranagua and Rio Grande. It travels up to 2,000km along congested roads, most of them in poor condition, in trucks which carry a maximum of 60 tonnes each. With the cost of road transport rising steadily as output increases year after year, farmers and trading companies are looking for a cheaper alternative. If all goes according to plan, more than half of the grains grown in the north west and north east, will soon be shipped from ports near the mouth of the Amazon river, or ports on the Atlantic coast such as Itaqui, from where the 200mt of iron ore produced at the Carajas mines now leaves. It takes several days less for cargoes shipped from these ports to reach destinations than that leaving from ports in the south. Brazil has an enviable 65,000km of navigable inland waterway, but for the time being, only a fraction of that is utilized. Three quarters of the total is either the Amazon river itself, or its numerous tributaries, far from where the country’s economic activity is concentrated. With the important exception of the Madeira river, which forms Brazil’s border with Bolivia along much of its length and for the Tiete-Parana system in the south east, which was affected by a serious drought in recent months, very little is used commercially at the moment. This is because numerous high waterfalls on most rivers flowing south to north, prevent the passage of vessels between the huge plateau where most of the grains are grown and the main rivers. About 200mt of grains are now grown in Brazil, almost 100mt of it soya, of which about 60mt is now exported each year. Eighty million tonnes of maize are also now grown and about 20mt of maize has been exported in each of the past four years. This has been made possible by an explosion in the amount grown as a winter crop in the centre west. World grain stocks have been growing steadily in recent years, after several years when supply exceeded demand. Demand in several key markets where most of the grains are fed to cattle, pigs and poultry, as well as to dairy cattle, such as China and also the EU, has slowed from its earlier highs. The combination of weaker growth in demand and a steady increase in supply, has caused grain prices to fall and they seem unlikely to rise again for some time This has become a great worry to farmers, who made high profits in the boom years. Farmers in Brazil have fortunately been shielded from the full impact of world price falls by the fact that Brazil’s currency has lost about 25% of its value in the past year or so, after having been overvalued for several years. For the time being at least, farmers are getting about the same amount in local currency in which most of their costs are incurred, as they did in the past few years. Despite some relief from the fact that the price of diesel fuel has fallen in the past few months, the cost of road transport has risen sharply in recent years in Brazil. Increased congestion means trucks often wait as long in queues at ports, as they take to travel the 2,000km distance from fields to the coast. New regulations restricting the number of hours drivers can remain at the wheel, is also adding to costs. The world population continues to grow steadily, while huge contingents still migrate each year from the countryside to towns and cities, where they eat more and better, particularly of meats and dairy produce. This means many million tonnes more grains will be needed each year from now on. Brazil is one of the few countries in the world which still has large areas of uncultivated land, and the country expects to be called on to grow 50% more than it now does, an extra 100mt, to help meet the extra demand. Brazil’s leading grains producing state, Mato Grosso, now contains Brazil’s largest herd of beef cattle and totals about 50 million head. But over the years, farmers have done little or nothing to ensure that the quality of pastures has been maintained, so yields have fallen. Beef farmers claim they do not make sufficient profit to make the needed investments in fertilizer to push up yields once more. Most farmers prefer to move their cattle on somewhere else, than to invest. But if enough fertilizer is spread, however, the land soon becomes productive again and millions of hectares are becoming available for planting grains. Brazil’s centre west has the potential to produce virtually all the extra which will be needed to meet the extra demand. If it can be got to ports cheaply enough. The privately owed Maggi company, founded by a farmer who like hundreds of thousands of others, migrated to the Amazon region from the state of Rio Grande do Sul, where soya was first planted in Brazil in the 1950s, was the first to see the potential of the waterways in the Amazon region. More than 20 years ago, Maggi built a terminal at Porto Velho, capital of Rondonia state, which is on the Madeira river. Maggi also built transshipment facilities at Itacoatiara, at the point where the Madeira joins the main Amazon river. The Amazon is still to 70,000 tonnes Capesize vessels at this point, about six days sailing from the open sea. Mainly because of draught restrictions on the Madeira, however, only about 2.5mt of soya, some of it destined to be crushed at a plant at Itacoatiara, have used this route each year since then. With supply and demand growing, however, Maggi is now investing about $250 million in installing a new floating transfer facility at Itacoatiara. This new system will unload soya beans from barges and swing them directly into sea going vessels moored alongside. Maggi has also built a new loading terminal downstream from Porto Velho city, where the existing facilities have become congested, as the city has grown in size. Maggi says a floating terminal, a novelty in the Amazon, can be built faster and at lower cost than a fixed terminal.The new facilities will allow the amount to be shipped down the Madeira to rise to 5mt a year. Some other companies take soya beans in barges from Porto Velo past Itacoatiara and on to the terminal at Santarem, a city close to the mouth of the Tapajos river. The Tapajos and its numerous tributaries stretch north into an area where huge amounts of soya is planted. It is along this river system, that virtually all the large trading companies which arrange the shipment of most of Brazil’s grains, have set about building new terminals, now becoming accessible by a paved road. Bunge, ADM, Dreyfus, Cargill and Noble, as well as smaller Brazilian owned companies such as Caramaru, have each ordered dozens, in some cases more than a hundred brand new barges which will carry the grains downstream, as well as the ‘pusher’ vessels which will push trains of barges to ports near the mouth of the Amazon. Such ports are all two or three days less sailing time to ports in Europe, north America or Asia, than are the traditional southerly ports of Santos and Paranagua. Bunge was the first to develop this route and the company plans to ship up to 4mt of soya from the terminal it has built at Miritituba, some 400km upstream from Santarem, to the Port of Barcarena, also known as Vila do Conde, just 20km from the largest city in Amazonia, Belem, capital of Para state this year. Cuiaba, with Santarem, and which is in the process of being paved, for numerous new terminals. Up to 7mt of grains will soon be using this route. To cope with the heavy traffic, it is planned to build a second carriageway on the BR 163 road, as well as to double the thickness of its asphalt. The poor quality of much of the 60,000km of paved roads in Brazil hinders the use of modern seven or eight axle trucks, by slowing their speed and increasing the cost of maintenance, particularly of tyres and suspensions. Despite the fact that a far higher proportion of the soya and maize grown in Brazil will leave from ports in the north and north east from now on, the ports in the south, notably Santos and Paranagua, do not anticipate much less will be shipped from there. Seventy per cent of the 7.6 mt of soya beans, and the 5.1mt of meal now shipped annually from Paranagua, for example, is grown in the nearby state of Parana, and only 18% of that shipped arrives by truck from Mato Grosso. Paranagua is also home to numerous fertilizer blending plants, and with no likelihood of significantly more of the 30mt of fertilizer now used in Brazil being produced in the country, taking this fertilizer north to where it is needed, means there is a return cargo for the trucks delivering soya at the port. Ambitious plans are periodically published with great fanfare for the building and expansion of Brazil’s rail network. These include the completion of the notorious 2,500km-long ‘North–South’ line construction of which began 30 years ago, to run from close to the Carajas mines, south to Sao Paulo state, but which is still only operational for half its length. Poor management and weak supervision, means that although much of the track bed has been laid, embankments have collapsed, rails have been stolen, and poor-quality sleepers have rotted. This sad story is now being repeated on two equally ambitious 2,000km lines which will eventually link ports on Brazil’s atlantic seaboard with the centre of the country. Running directly west, the lines will eventually allow grains, iron ore from new mines, oil products and fertilizer to be carried to ports or taken inland. A start was made almost ten years ago on the two lines, but work has now ground to a halt because of lack of funds or planning restrictions, notably that key wayleaves have not been negotiated. Proposals have also been made more recently by politicians to build other new lines in the soya producing area, often to run parallel with roads which have themselves not yet been finished. This confusion just serves to draw attention to the failure of successive Brazilian administrations to complete projects which had been started, and favour new ones instead. Until 25 years ago, the rails needed for Brazil’s 30,000km network were made at local steel mills, most by the National Steel Company, the CSN. But due to the lack of demand, CSN ceased making rails, which have been replaced by imports, most from China. has refused to start making rails again. The company does not feel that demand will be strong enough to allow it to get a return from such an investment. In theory, large quantities of rails will be needed to keep the existing 30,000km of track up to standard, and to equip the 5,000km or so of new track which the government wants to see built. The reluctance clearly indicates that one interested party at least, has little faith in the plans for rail coming to fruition in the near future. Virtually all the large trading companies which operate in Brazil have facilities able to crush the millions of tones of soya grown in this area in Rondonopolis, which is linked to ports by the ‘Ferronorte’ system. The trading companies also handle or store the increasing amount of maize, now planted in Brazil’s centre west region as a winter crop. Paradoxically the fact that more grains are now carried along the Ferronorte and other much older lines which cross Parana and Sao Paulo state, to ports, as well as Brazil’s mainly coastal cities, has resulted in rather than journey times falling, as had been promised, speeds have fallen. Although companies have invested in a new generation of rolling stock, the permanent way has not been improved sufficiently to allow trains to run faster, or to negotiate junctions more easily. The lack of investment in upgrading track, has neutralized most of the advantages which it had been hoped would have been brought by the purchase of thousands of the latest generation of wagons which can be loaded and unloaded far faster than the previous ones, as well as the purchase of a new generation of larger, and more powerful locomotives. Rather than speeding along, as was planned, trains now spend 40% of their time waiting at junctions, or at crossover points. As a result, the average speed of a train continues to be about 30kph, exactly what it was before privatization. Maize can be grown in Brazil’s far west more cheaply than nearer the coast, but the high cost of transport, by both road or rail, means that this grain is not always competitive in export markets, and may have to be subsidized to become attractive. To get round this, many oilseed crushers have built plants which make biodiesel fuel out of maize in the past few years. Seven per cent of biodiesel now has to be added to all the mineral diesel used in Brazil, and because of its huge fleet of agricultural machines, and also because so many trucks collect, or deliver goods in Mato Grosso state, the state is also one of Brazil’s leading consumers of diesel. As more soya is planted in Mato Grosso in the summer, more winter maize will be planted there as well. Many readers will be aware of the fact that Brazil’s state owned oil company, Petrobras, has become engulfed in a massive corruption scandal, involving payments to suppliers, as well as politicians in the past couple of years. All of Brazil’s large construction companies, which have won the lions share of contracts for building roads, railways, and ports, as well as oil installations, have been caught up in the scandal. As a result, most construction companies are finding it extremely difficult to obtain credit, so have had to reduce their participation in infrastructure works. It will probably be some time before all aspects of this have worked through, so delays can be expected. If the fall in the price of grains is encouraging the trading companies to increase their investments in waterways, the collapse of the iron ore price is forcing the Vale mining company to reduce its investments and seek to cut costs. So far,Vale has not slowed investments at its new mines at the Carajas project which includes opening a brand new set of workings and mineral processing facilities. The 800km railway which links the mine to the port of Itaqui is being duplicated. Vale is buying about 10,000 new rail wagons, and several hundred new locomotives, which will allow output to start at a mine where the cost of extracting ore will be far lower than that of most mines in the Minas Gerais state. Mines in Minas Gerais, now responsible for about 50% of Vale’s total production, will fall by about 50mt. It will not be possible to transfer rolling stock from Vale’s railway in Minas Gerais, to the Carajas system, because the gauges of the two railways are different.